The exclusive piece shedding some light on the secretive gathering was published by the Grayzone portal on Saturday. Blumenthal has obtained a check-in list of a private roundtable dubbed ‘Assessing the Use of Military Force in Venezuela,’ which was hosted by the DC-based think tank the Center for Strategic and International Studies (CSIS). “We talked about military… uh… military options in Venezuela. That was earlier this week though,” research associate at CSIS’s Americas Program Sarah Baumunk said. She promptly grew nervous, adding that she didn’t “feel comfortable answering these questions” and hung up on the journalist. The list of participants is surely impressive – the roundtable has brought together former and incumbent military and civil officials from the US and South America, representatives of USAID and Organization of American States (OAS) as well as analysts from various think tanks. Several figureheads ‘appointed’ by the self-proclaimed interim president Juan Guaido were also in attendance. The meeting was also attended by self-styled officials of Guiado’s “government” – public policy advisor Daniel Sierra and ‘ambassador’ to the US Carlos Vecchio. Participation of said “officials” sounds ironic given their previous efforts to advertise Guaido’s so-called ‘Plan País’ to reconstruct the country’s economy. 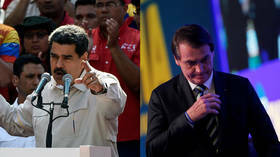 When the plan was officially unveiled a month ago, the two have spoken a lot about “reestablishing Venezuela’s democracy,” protecting “individual economic rights and freedoms” and ensuring “citizen security.” Given the topic of the CSIS’s discussion, the figureheads of Guaido’s “government” don’t actually mind to bring this ‘prosperity’ to their homeland through a foreign invasion. It should not be surprising, though, since even the Plan País itself was unveiled at the Atlantic Council – the US and NATO funded think tank. While the closest supporters of Guaido are pushing for foreign intervention, Blumenthal believes that regional partners of the US are quite reluctant to partake in it. “Any US invasion of Venezuela would be contingent on the consent from the Colombian and Brazilian governments and its very unclear that they’ll get that consent,” Blumenthal said. While talking of the “use of military force” in secrecy, the US continues to tempt Venezuelan citizens and officials with promises of lavish aid – which, of course, would only be possible if the legitimate President Nicolas Maduro is ousted. On Saturday, US Treasury Secretary Steven Mnuchin said Washington will lead the effort to salvage Venezuela’s economy – which it has so far been strangling with sanctions.